One thing I obviously discovered immediately in my Mac conversion this weekend was my loss of Windows Live Writer, the free blogging software. I used Live Writer quite often, especially when scratching out the earliest drafts of a blog post. What I discovered this weekend is that it isn’t available for Mac and there’s really no equivalent solution available of my MacBook Pro. 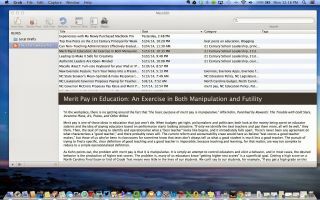 I searched the web and stumbled across this article, “A Blogging Tool for the Mac That Is Close to the Windows Live Writer.” It describes an application called MarsEdit, an blog editor for Mac users. I immediately found the application in the App Store, and saw that it wasn’t free; it was $39.99. After obviously getting Live Writer free all these years, I was reluctant to pay that price. Still, I wanted some kind of blogging software that allowed me to compose blog posts offline. I continued to search, but I found nothing else. Being able to compose blog posts offline is important for me. Many of those posts stay forever doomed to spend their days in my local draft folder, but my writing processes means I have to often slog through those posts to get to the ones I want to post. There are also times I sit and compose drafts without an Internet connection, so being able to find a blogging editor that allows me to compose offline was important. Compose blog posts while offline. I can format text and posts easily, though the formatting tools in MarsEdit are located in a drop-down menu and not as buttons within the interface. I can preview posts before posting, though not with my true blog theme in the background. I can easily select categories for my posts or tags. I can post either as a draft or as a live post with the click of a button. My overall assessment of MarsEdit? It is a functional blog editor for those Mac users who, like me, are looking for a way to compose posts offline and don’t particularly care for the online Blogger interface. Obviously, I could compose those posts in a word processor or other text processing tool, but as you know, when you copy and paste that text into the Blogger editor online, sometime very quirky things happen. All in all, I am satisfied with MarsEdit. It is a completely functional blog editor.